There are many beautiful trees and shrubs that we are tempted to grow in our gardens, but with the smaller gardens that are becoming more normal, the space can quickly be filled and our ‘wish-list’ remains just that – merely wishes. There is however a simple technique available to everyone that will dramatically increase the number of trees and shrubs you can grow – an easy method that is not widely known but which turns heads whenever it is seen. 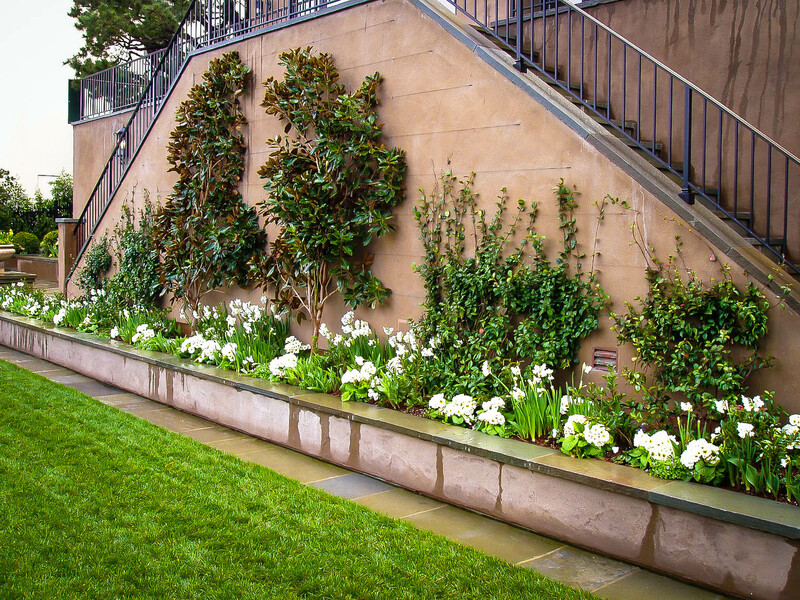 The technical term is espalier, but in plain English it just comes down to growing plants on walls. Most people think of vines and climbing plants when it comes to covering a wall or fence, but the same thing can be done with almost any tree or shrub, freeing up lots of space by vertical gardening and allowing us to grow those favorites without needing a big space to do it. If you don’t have many walls or fences you can build simple supports with posts and wire that will give lots of room for flowering plants or for growing fruit trees and berry bushes to get the biggest yield from the smallest space. 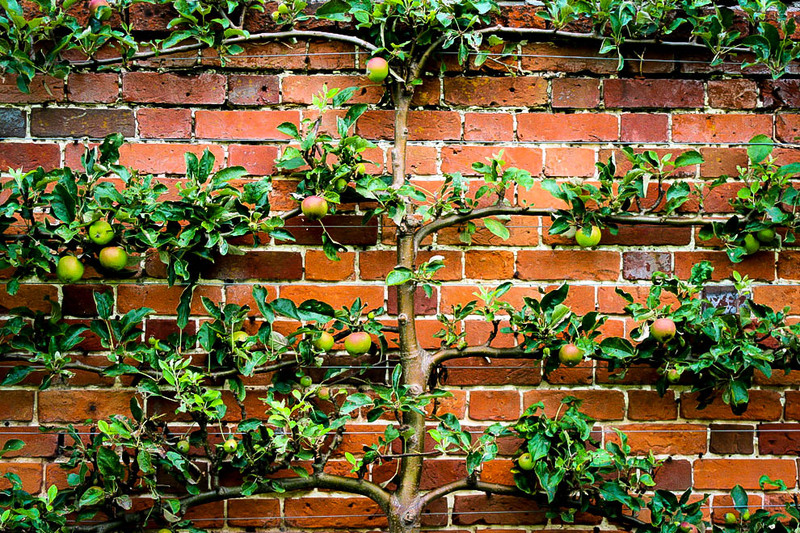 What Is An Espalier Tree? The principle behind growing plants in this way is simple. Instead of letting your bush grow as it chooses, in all directions, the branches are spread-out on a vertical surface, tied in and then by regular pruning encouraged to flower or fruit profusely, while taking up very little space. Any wall can be used – your house or garage for example, or a wall dividing your property from your neighbors. It doesn’t matter which direction the wall faces, but south or west-facing walls are great for sun-loving plants, while shady north-facing walls can be covered with shade-lovers. This is also a great way to grow fruit trees and fit a large number of varieties, including the necessary pollinators, into a much smaller space. Instead of two or three large trees, you could grow eight or ten espalier trees on wires in the same space – more variety and no over-production! If you have an existing wall or fence, getting ready to grow your wall trees is simple. Insert some strong eye-hooks at either end of the wall, spaced around 18 inches apart up the wall. With a solid wall or fence, use a six inch eye-hook so you have some space behind the wires for air circulation. Stretch strong galvanize wire horizontally between the hooks, running it through additional eye-hooks at about eight feet intervals along the wall to prevent sagging if you have a large wall to cover. Put a small turnbuckle at one end so that you can easily tighten the wire as needed. The wires can also be stretched between posts, making a low-cost living wall to divide the different parts of your garden – it is a great way to separate your vegetable garden from your flower garden, for example. 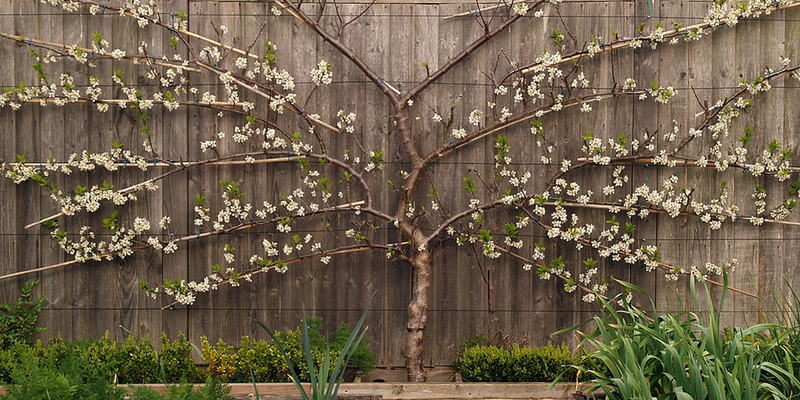 If you have an existing trellis fence, then you can just attach the branches of your trees directly onto the trellis. On your house you can go up between and even around windows, so that your wall becomes a living picture, full of flowers or festooned with ripe fruit. Since the soil right at the foundations of a wall is often poor quality, it is especially important to use lots of organic material when preparing your planting hole. Remove any debris you find as you dig so that you have an area of good, rich soil for your trees or shrubs. Plant your tree as normal – see our planting guides for details – and use mulch, since the soil may get less rain-water than further out in the garden. For some plants, like the fig tree, this can be a good thing, but for others you need to pay a little more attention to watering of your tree may become too dry. As your tree grows, tie the new branches to the wires, pulling them down and spreading them out. By one of those quirks of nature, when you bend down the branches of trees they produce flowers all along the branches instead of just at the ends, so this method increasing flowering dramatically. 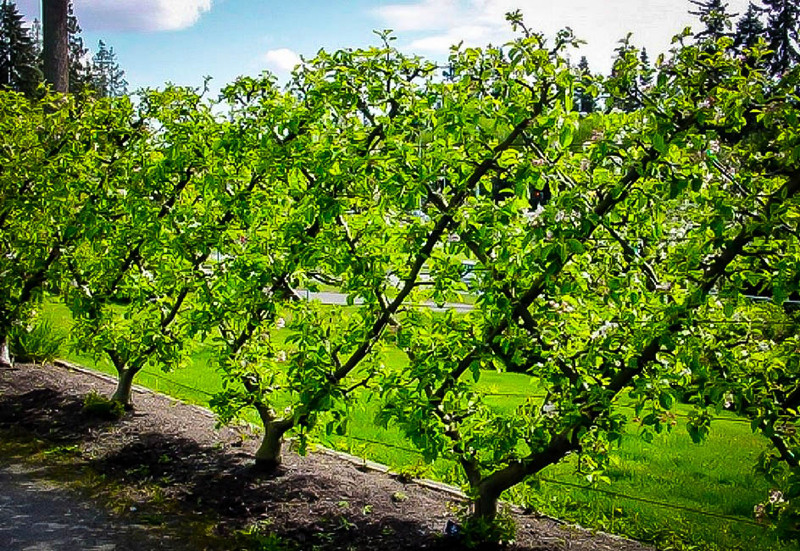 As you can see here, you can spread out the branches in various patterns, so that even in winter your wall plants look interesting, but for fruit trees, a 45o angle gives the best yields of fruit. You can also just follow the natural pattern of your tree, bending and spreading the branches as they grow. Pruning wall plants is a little different from pruning regular shrubs and trees, since you have a permanent framework and you will prune back to that each year. The basic rule is that plants that flower in spring should be pruned right after they flower, while plants that flower in summer and fall should be pruned at the end of the winter, before they make new growth. Strong shoots can either be used to build new framework branches, or cut off at their base i they are not needed. As your plants mature it may be necessary to remove some older branches to encourage new stems, especially with flowering plants. The most common types of plants grown in this way are fruit trees. If you live in areas which are a little cold for a particular tree, for example for peaches or nectarines, then the warmth of a south-facing wall can make all the difference. One type of fruit tree that does especially well in colder areas when grown on a wall is the fig tree. Whether you choose the Chicago Hardy Fig Tree for the coldest regions, or a Brown Turkey Fig Tree in milder areas, fig trees respond really well to being grown on a sunny wall and will produce far more fruit and suffer much less winter damage than if they are grown in the open in a colder region. Growing fruit on walls and fences is a wonderful way to feed your family fresh, wholesome produce and get a lot into a small space, but this same method can also be used just for beauty. 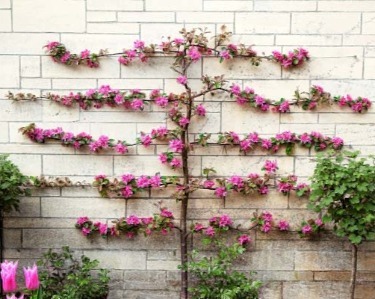 Almost any flowering tree or shrub can be grown on a wall and trained, so imagine, for example, an Okame Cherry Blossom Tree covering the side of your house. Or picture a Magnolia tree in full bloom, its blossoms just below your bedroom windows. 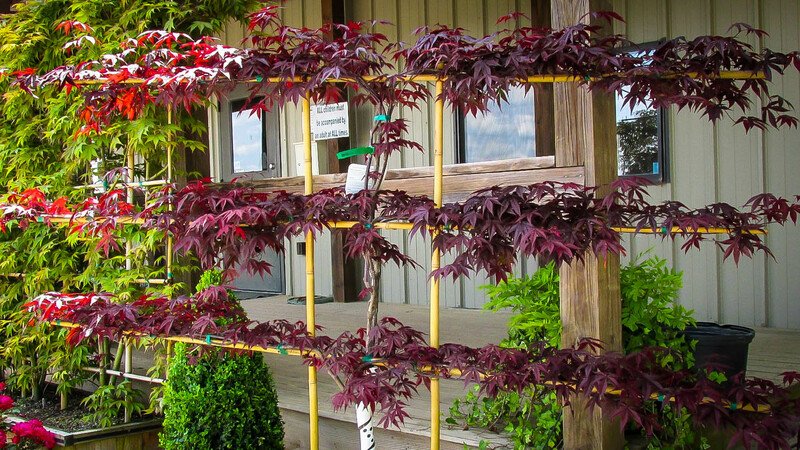 Some trees are so beautiful they don’t even need flowers to be worth growing this way, so imagine the lovely Bloodgood Japanese Maple trained across a wall, or a Western Redbud, which needs maximum warmth when grown in the east. It will reward you with flowers in spring, charming summer leaves and wonderful fall colors. In colder areas the Aristocrat Pear Tree is a great choice or for stunning purity the white Bridal Memories Lilac, while on a shady wall the Tardiva White Hydrangea will be truly beautiful. Just as with fruit trees, growing flowering trees on a warm wall allows us to grow as much as a whole zone warmer than in the open garden. Many people admire the Southern Magnolia but it grows best in zone 7 or warmer – unless you train it on a wall. Then it will grow even in zone 6 on a south-facing, sheltered wall and this is a great way to bring the south closer to home. With its glossy evergreen foliage and wonderful dinner-plate sized fragrant white flowers, this tree is a great choice for a wall plant that will grow right to the top of a two-story home, with the fragrance drifting into your bedroom on a summer’s evening. Choose the Southern Magnolia “Blanchard” for warmer areas – after all, not everyone on the south has a garden large enough for a free-standing tree – or in cooler regions select the Southern Magnolia “Edith Bogue”, which is one of the hardiest varieties available. Finally, let’s not forget the wide variety of Crape Myrtle Trees that are available. These too will grow and flower spectacularly on a wall or fence, without taking up any room in the smallest garden. With their all-summer blooming and their stunning fall colors, they offer months of beauty that will turn heads and make your house something very special indeed. What we can grow in this way is only limited by our imaginations and growing flowering or fruiting trees on walls and fences opens up a whole new world that will literally bring a brand-new dimension to your yard and your gardening. 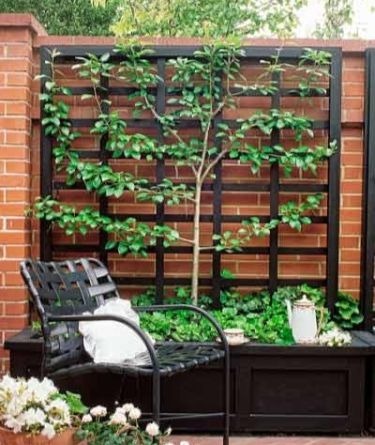 I would love to try to grow an espalier wall. Would it be possible to use lilac bushes? Great idea! You could use an older type, with large flowers, or one of the newer ones, with smaller flowers, depending on how big your wall is. The only thing is, lilac stems can be stiff, especially with the twiggy, more compact varieties, so a taller one would have more flexible stems and be easier to work with. bend them back while they are young, and tie them loosely so you don’t cut into the stems as they thicken. curve them over in an arching shape, not straight up, as more side buds and more flowers will develop from arching branches, with the tip lower than the main part of the branch. Cut back the stems immediately after flowering to just a few leaves at the base of the new shoots that produced the flowers, to keep it more compact and to encourage lots of blooms for the next year. Walt Whitman, here we come!